How does your approach compare to Consistent Hashing? Consistent hashing has the property that only a small number of entries need to be remapped when a node is added or removed. This is great for something like a huge DHT or a distributed work queue. But with sharding, any remapping is actually pretty painful (since moving data between servers is hard if you want to do it without any data loss, data downtime, and still maintain transactions). To answer your question directly: 1) URL-based sharding never requires you to remap data, ever and 2) URL-based sharding is a lot simpler to use. There's no complex algorithm to go wrong, just a simple lookup table. Of course, you could use URL-based sharding to "wrap" a CH algorithm (or any hashing scheme you wanted). And that's the other point I was trying to make in this post: having a consistent data _addressing_ scheme is almost more important that the particular partition scheme you choose. Thanks for sharing this technique for abstracting sharding policy from the code that queries the sharded data sources. I like it. I've worked on some systems in the past that had separate sharding policies for different data sources, each with their own data-type-specific function for obtaining a handle to a db connection/rpc stub/etc and the sharding policy decisions were made in that function. Using a more generic obtain-a-handle function that gets passed a URL is nice, as long as the same type of handle can be used for multiple data sources. For data stored in MySQL it's a no-brainer but it's not quite as obvious how to apply this pattern in systems that use an RPC mechanism such as Thrift. Maybe instead of a new_db_connection("customer://1234") function that returns a db connection handle it would be more useful in such systems to have a function like addr_for_shard("customer://1234") that would return host & port for the appropriate service share or whatever info is necessary to construct an RPC stub. if you shard some tables to a new server,will the sql statements updating or deleting those tables be pointed to the new server? how can we keep a complete view of all the data of ONE system? using replicas? how to prevent lags? Whoa. "Sharding?" A quick Google seems to show it as a term coming from someone who worked at Flickr... which came of course, from an MMO project (Game Neverending). And in MMOs, of course, it was a fiction-derived term for parallel servers which has managed to stick (many people refer to parallel VW servers as "shards" now). Did a DB term of art come from UO? How odd. Raph, as usual you've hit the nail right on the head. I've always liked the term sharding precisely because it has a well-known video game antecedent. That makes it easy for people to visualize. The only difference (ok, one of many, but still) is that WoW shards have way more interesting names. Still, the idea that your character exists on only one shard makes intuitive sense, and it's that sense that is easy to generalize. There are two flaws with the idea of storing your shard mappings in memcache. Memcached is not persistent; Memcache keys naturally fall out as new data enters whatever slab your mappings are in and don't forget that machines do restart from time to time. I don't think sharding came from the MMO world, we were using the term at Google before MMOs started becoming popular. Even though I had done it before, I had never heard the term 'sharding' before joining Google (early 2003) so I always thought the term originated there. The term was in active use in 1996 in the MMO world, which predates Google's founding. I asked some of our DB guys here and they said "bah, another name for vertical partitioning!" :) But they also said "I always wondered where the term came from..."
Hey, I stand corrected! I always wondered, too. consistent hashing: only having to rebalance a small percentage of your data hosts when you add a new database is much preferred over regular hashing where full rebalancing is needed. Nobody I know uses plain hashing for that reason. If you have a natural partition point, and a natural place to store data, like a blog and a blog's owner, you can store which partition a blog is on with the blog owner's user record. In fact, that's how we did it with Blogger for a long time. Systems that don't have natural partition points e.g., they need large subsets of data to be available for local JOINS or querying, have a much more difficult time of sharding. You have to take those queries built using JOINS and populate them in separate systems, like Facebook does using Cassandra. Take a look at some of their recent presentations on the subject of using Cassandra to build indices. Cassandra is ultimately designed to act like Google's BigTable which automatically partitions data according to locality. Similarly to the 'natural partition point' example I gave above, it uses a master (with replica) to keep track of where keys are stored on what tablet servers. Check out the BigTable paper. I miss using it and am hoping that Cassandra eventually stacks up to BigTable. It seems to be taken as a given in this article that you're going to be using relational databases. Why? By pushing the shard-selection logic down into the db connection access code, you abstract the fact that the system is sharded from the caller. This is a convenient approach when you know that ever query for an asset will only go to a single shard, but what if you have to aggregate across multiple shards? Not a JOIN necessarily, but an IN clause or an order by date criteria? No doubt this requirement will arise just after you've partitioned your data. How would your application code need to be modified to support this since the sharding is abstracted at a low level? Agree with BillG. Nearly every SQL query I see has a join. This type of vertical partitioning 'sharding' scheme won't work in most cases. And, it will lead the developer to write badly normalized databases. 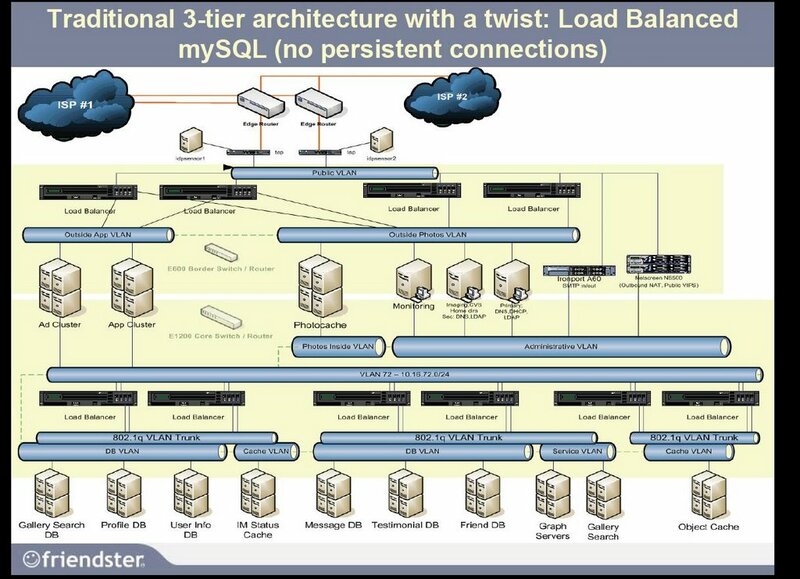 However, isolating the data load-balancing decisions in the db abstraction layer makes good sense. Riffing off of your url idea, what about using a parser in the db class to sniff incoming sql queries (or urls), and connect accordingly to a pair of mysql master/master servers. SELECT's go to the read-optimized server, INSERT's and UPDATE's go to the write-optimized server. Since both servers read and write (and flood data back and forth), there is a lot of flexibility when making improvements to the balancing algorithm. Not to mention built-in data backup (heh). It would be a short step to spawn more mysql servers and create a cluster, if the load became enormous enough. hi, your artical and information is able to help me. Do you provide any consultancy services on how to design a Shard base architecture? what is your company web site or email address? This is a good summary and very useful data layer scaling approach. You can easily extend the approach you recommend by adding a web services layer (with appropriate caching) on top of this data access layer and under the covers adding different types of data stores which work ideally for particular types of data (like Tokyo Cabinet for a highly write intensive fixed width key value store).